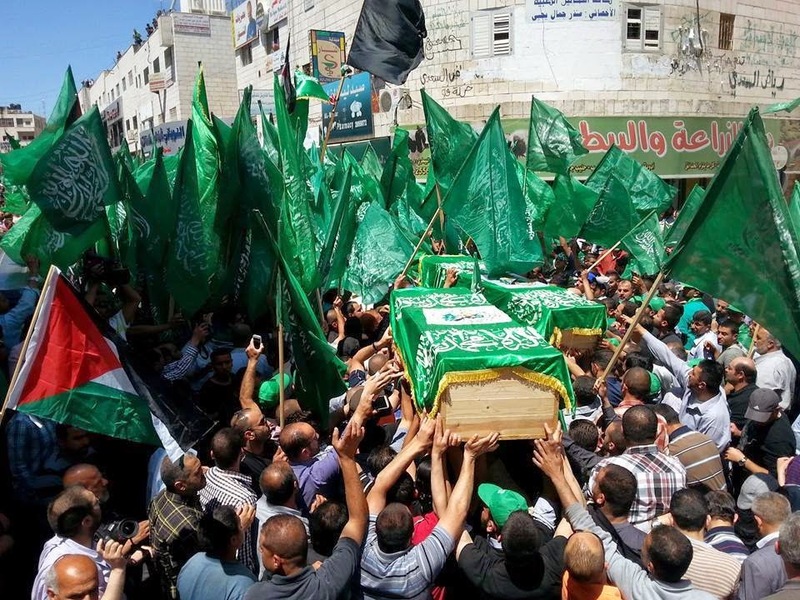 "The funeral of the remains of the martyr who gave his soul for the struggle of a nation that strives for freedom" (that's a direct quote) received significant coverage on the government-controlled official Palestinian Authority news outlet, PA Television, this past Wednesday, April 30, 2014. 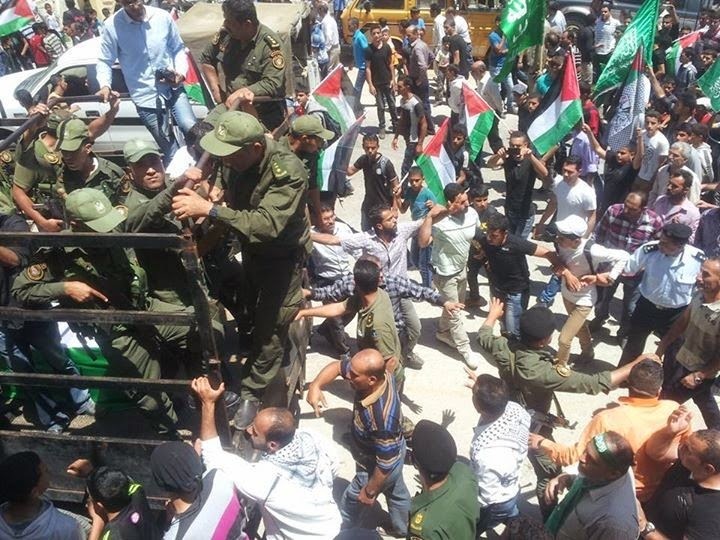 The savagery celebrated by the Palestinian Arab crowd cost 15 human lives, 8 of them children, all of them Jews. 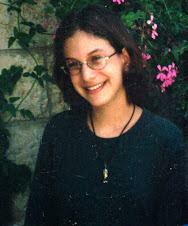 One was our daughter Malki, 15. The ceremony and the events leading up to it received wide media coverage in the Arabic-speaking world. For instance, we found brief video extracts here and here, as well as an official Hamas-authorized video "invitation" here to encourage people to attend. Longer videos of the live coverage are here and here with notably solemn and respectful interviews of the dead man's family here. Photographs are at the bottom of this post. The event itself was made possible by Israel's incomprehensible handing over last week of the decomposed remains of Izz Al-Din Al-Masri. He was the human bomb whose explosion caused a massacre in the center of Jerusalem on August 9, 2001. Wednesday's funeral celebration took place in the northern Samarian town of Tubas. 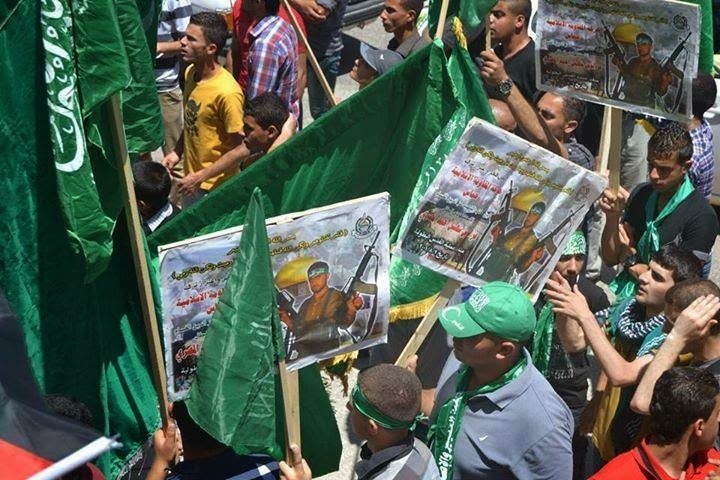 Personages representing both the Mahmoud Abbas-controlled PA and the Hamas terror organization took part. A PA National Security Forces military vehicle provided transport for the human bomb's remains. 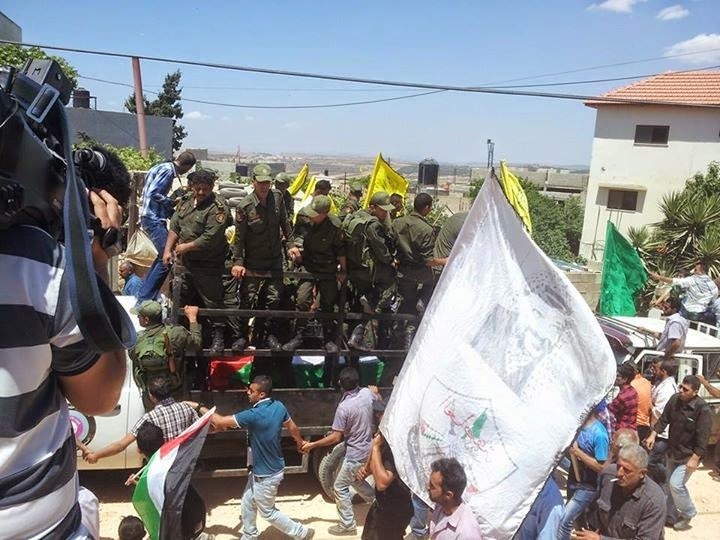 The PA military adorned the funeral procession, and the PA-appointed governor of Tubas, Rabih Al-Khandaqji, took part and eulogized al-Masri and his barbarism. So did the PA-appointed mayor of the human bomb's town. Palestinian Media Watch, an indispensable source for anyone wanting to know what the Palestinian Arabs hear from their leaders when they think no one else is listening, this afternoon published a summary of the media coverage. 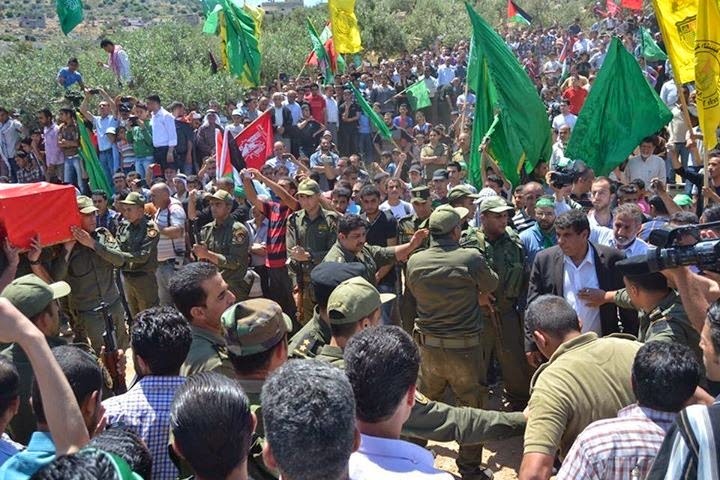 Photos from various Palestinian Arab online publications show that the dominant visual effect of the grand celebration was the color green. In their culture, green means Islamism and Hamas. 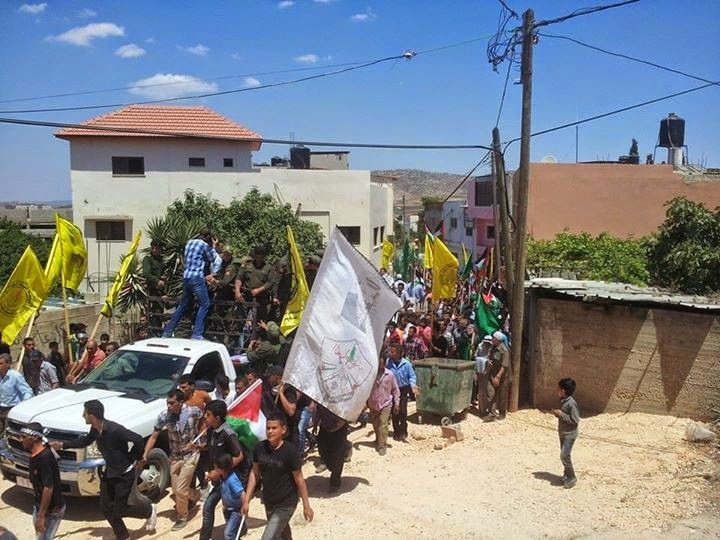 Hamas flags were everywhere, and bear in mind that this is the heartland of the PA-controlled West Bank. Back in August 2001, starting just a day or two after the Sbarro massacre, al-Masri's father was 'marketed' to both the BBC and the Australian Broadcasting Corp as a lover of peace and as a worthy interview subject. We know this because both the ABC and the BBC approached us, astoundingly asking that we take part in double-headed interviews: on one side, the freshly-bereaved father of a child blown up just a few days earlier by a human bomb; on the other, the parent of the human bomb himself. We declined both invitations with considerable puzzlement and anger. We soon had cause (as we wrote here) to wonder what kind of soul-less reporter thinks that sort of proposal is moral and professional. Are you reading this, Tim Palmer? 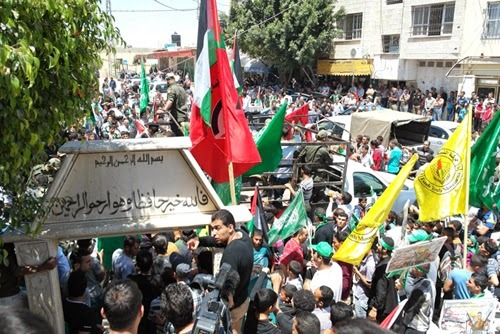 The al-Masri funeral received significant coverage in the Arabic media. But it got virtually none in the mainstream news channels of the non-Arabic-speaking world. The fact that most of our readers don't know about it does not mean it has negligible significance. 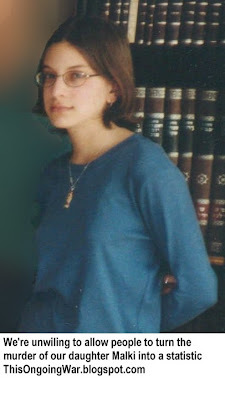 Quite the contrary: if you look at depressing reports like today's PMW article about official Hamas TV running programs that persuade little children to become gunmen and killers ["Hamas to kids: Shoot all the Jews"], you see that making al-Masri a martyr and a figure to emulate is part of a deeply dismaying, ongoing strategy that continues to drag Palestinian Arab society - along with those who give such pathological forms of education their passive or active support - down into the gutter of human society and history. Strong words? What else to call a process in which the leadership of an entire society - Abbas and his PA; Hamas; the Palestinian Islamic Jihad - seeks to turn its pre-teen children into human bombs? My wife and I were so saddened to read of your beautiful daughter's murder and so angry about the media treatment of you. The ABC couldn't care less about compassion, they follow or create a story about tragic circumstances and try to blame the victims as they have in your case. You are helping people to understand what Israel and Jewish people are going through at all times. We only wish we could help. all I've done is make a complaint to the Press Council concerning the pro-Palestine and anti-Jewish bias of the stations reporting. we are an older couple who live in Cairns and are blessed with 5 adult children and 10 grandchildren none of whom live in Australia. If you ever want a break and come to Oz our home is yours. Yes we are Jewish but this is not written by a Jew to a Jew but from one parent to another.